We’re full of hope for the new season. Fresh optimism; a bouncy number dropping down on our phone…or maybe it’s that other-worldly shadow that stalks our dreams, Sasha. We like the new faces, but there are some we already miss – Papa Arnott, we hardly knew ye. The possibilities of what we’ll see hit the ice in just a few months are many and it will be fun to see what shakes out. And we can’t wait to see the baby Caps at Development Camp. But we’ve been stuck behind desks obsessing over the likes of Bernanke, Cantor, and the other usual suspects of DC, unable to make it to Kettler for the fun and games and fights. So we called in some help. Camilla goes to George Mason High in Falls Church. She says that just because she wears mascara, it’s no reason to call her a puck bunny. She’s in the school band, a student athlete and is Caps crazed, one of the shock troops in Alzner’s Army. Although it’s still years away, Camilla is interested in a career in sports journalism, so we thought we’d send her to camp too, hockey blogger camp. We gave her a simple first assignment – write a little about what she saw and heard at Thursday’s scrimmage – capture what she could and play it back to us. Escorted by her dad, she took it all in and up close, never having seen a practice at Kettler before. Not only did Camilla file on time, she beat her deadline by four hours. When you first step into Kettler it feels like the third Ice Age is upon you, as my Dad and I figured out after stumbling around the mall parking lot for 10 minutes. 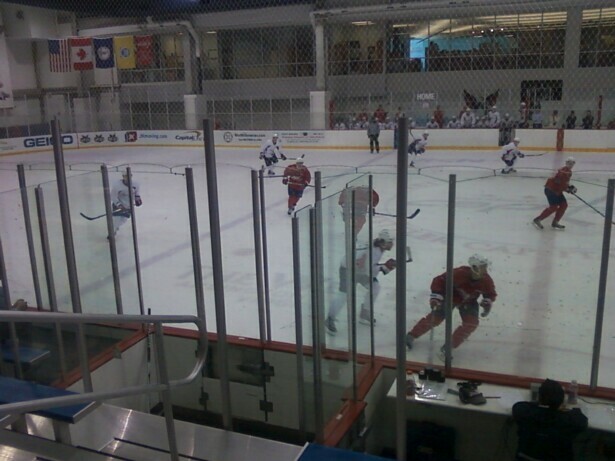 We didn’t get up at the wee hours of the morning and perilously drive through rush hour traffic to feel Kettlers superb AC, but still had come to see the intrasquad game at D Camp for Day 4. As I sat on my stone cold seat shivering in my J. Crew sweater, listening to my Dad talk about the players at D Camp, I saw a lot. I saw Brucie standing directly across from me (we totally made eye contact! ), I saw players lining up on the bench preparing to warm up, and the big banners of the Caps greats from yester year; Langway, Hunter, Labre, and Gartner. My musing was interrupted by what I thought was thunder (not another thunder storm! ), not just a slap shot hitting the glass. It looked a lot like the warm up for regular NHL games, but without the kickass music. After all the excitement of the first and second period, I was cold and hungry. Who would’ve thought humidity could feel so good? After our refreshing bout of July weather, we scampered back inside to catch the final frozen period. At this point it was 2-1, start of the third. While White came in ready to seal the deal soon after taking a 3-1 lead, Red was firing back, ready to fight for it which resulted in a 3-3 tie late in the third. Just in time for a shootout, sadly the Reds didn’t muster quite enough fighting spirit as no pucks found the back of the net. Team White swooped past the goalie and came out with a 4-3 shootout win. I was then lucky enough to con my dad into getting me an Alzy shersey (he’d better sign) and taking me out to lunch. [Ed note: Yay Dad!] Next time all I need to remember is my parka so I don’t lose an appendages from frost bite. Until then, I’m going to try to save a few toes. Thanks Camilla and thanks Dad. We hope Alzner signs as well. We’ve got Friday covered and we’ll dress accordingly. Let’s Go Caps! Let’s Go Mustangs! 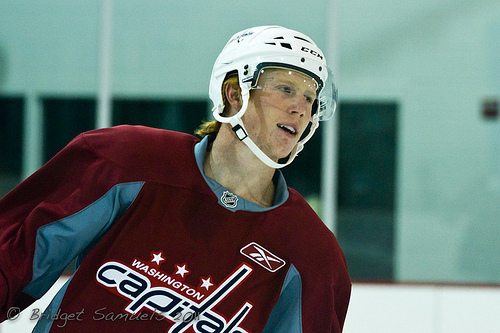 This entry was posted in Washington Capitals and tagged Camilla, development camp. Bookmark the permalink.